Wow, I did it. I beat my own personal best record for trips around the sun…that I know of. Go me! Hahaha. Yeah, it was that time of year, “Hime” and I had our birthdays. It has been about 20 years, but I still miss her. My Akita named Hanako Hime., we had the same birthday! That really makes it a special day. Otherwise it was just another sun trip for me. Although this is the year I really understood, “time is almost up”. Beside the fact it could be so, as I write this. I am though just speaking about our limited “vision” of our time. 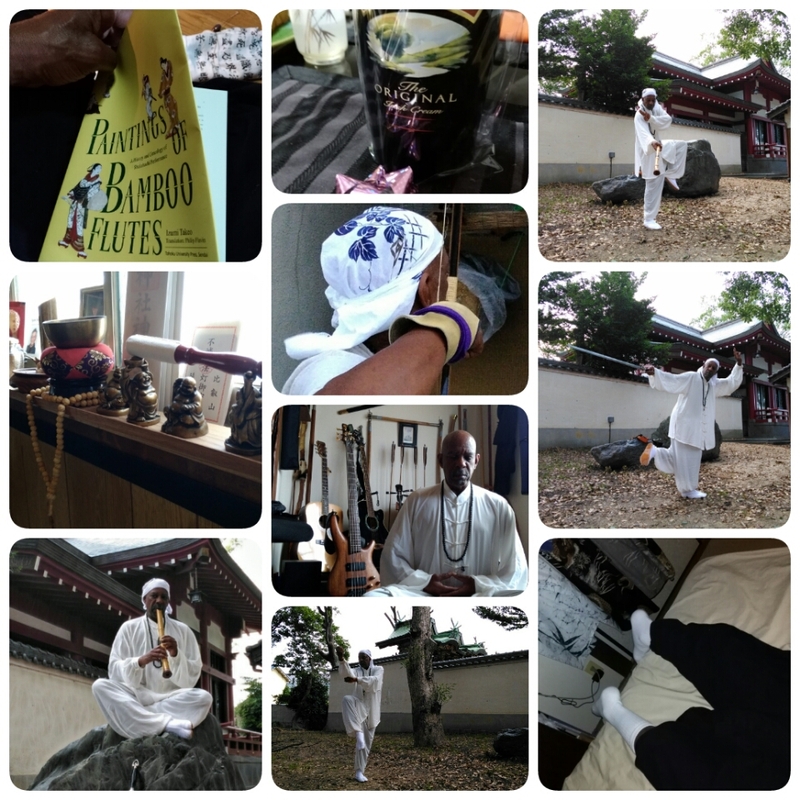 I spent the day quietly in meditation. 🙂 sounds very monkish ne?! Well, in a meditative state would be closer. I was up at 6:00 am, I wanted to get to the shrine, before the heat! It was a peaceful scene at the shrine, mornings are extra nice. I took in the calm of the morning and the vision of what had changed since my last visit. The clearing was larger, a tree gone, the boulders moved. I adjusted my spacial sense and made my plan. I would practice first then, do some blowing Zen for the Shinto spirits. I stretched a bit, and absorbed chi and the pleasure of muscles being awakened. I started with some Chen taiji, wanted to feel a sense of quiet power to set the tone for my day. 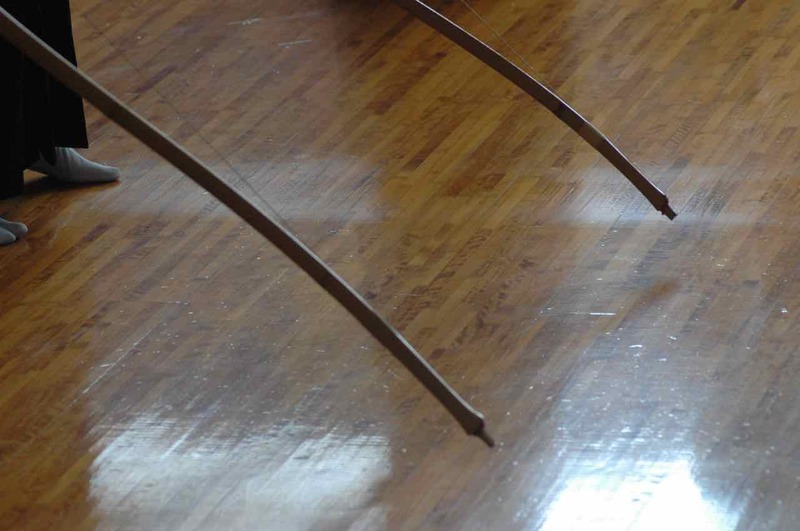 I followed those with Hing Yi, some Mantis and sword work. 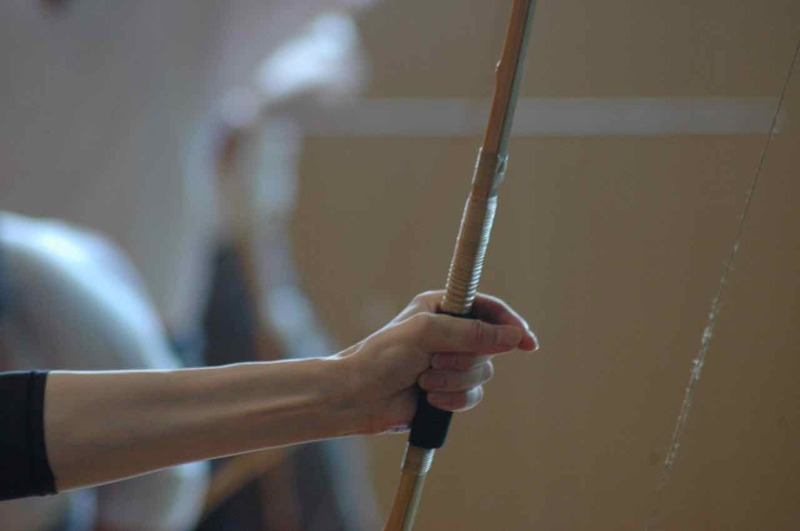 I had some ideas of how using the could work and blended some moves, ideas, principles from Mantis, Kali, and Shaolin and so was born : The Tao of Shaolin Chan Lohan Flute. In Japanese Shorinji Zen Rakan Shakuhachi Do. Sounds kinda cool ne!? I was just messing around, a joke. Still sort of fun to say I have created my own system, style as it were. It reads well, even though there will never be any students of Shorinji Zen Rakan Shakuhachi Do. My martial art legacy . The Mosquitos increased their attack and numbers. I thought to the Shintos Spirits well you guys don’t want me to kill here then you should keep them (the mosquitoes )at bay, WTF! Even with no smokey stuff they are dying from me splatting them. Nothing is changed. Ok, screw it, I went for the smoke thing again, thinking it will keep them away not kill them. I got the lighter to work, I tried to light a coil, it would not ! After several tries it did , burned a couple of seconds then went out. Several times of this a gave up. Ok ok I get it, I say to the Shintos! I tried to practice then to shakuhachi. I was being attacked by a horde of mosquitoes. Ok ok, I am out of here. Done! I bowed and left the shrine grounds. I walked back home, and needed to jump right in the shower. I was hot, sticky, and bitened. After a nice shower with some Dr. Bonners lavender castle soap I was feeling refreshed. I started my regular day from there, Zazen, short chant, breakfast. From there on it was pretty much like that, a bit of this and that a lot of shakuhachi playing, some other instruments, some gardening, a movie and nice NAP! Pretty much a cruising day. I had a lot of thoughts and feelings of gratitude. With the thoughts of aging came some goal settings for next year, and five. All personal achievement stuff except for becoming a modern Komuso. An Active, engaged practice. That is really more of my Buddhist path direction, ministry, something for the world, rather than something just for me, like getting that Yon-dan status. So I am feeling pleased to have gotten some sense of a spiritual life direction, I lost that with the Zenamaran and have just been re-centering, seeking a course. The day full thoughts and gratitude had very little, if any thoughts on how to make money in my senior years. My wife would not be happy about that. I should be more thoughtful of that as I see the world change and the sands of time drop. Logically I should be very concerned, my working years I spent concerned and lost it all. Now aging, wiser(? ), why do that again…all my possessions can fit in one room, rely on only the Universe as my support. So far it has worked for these years. Basically I am just along for the ride. My quest to consistently get that note continues. Of course I am that stubborn kind of guy. It is understood in the music world the extreme difficulty of play a shakuhachi. Some take a month(s) just to make a sound. 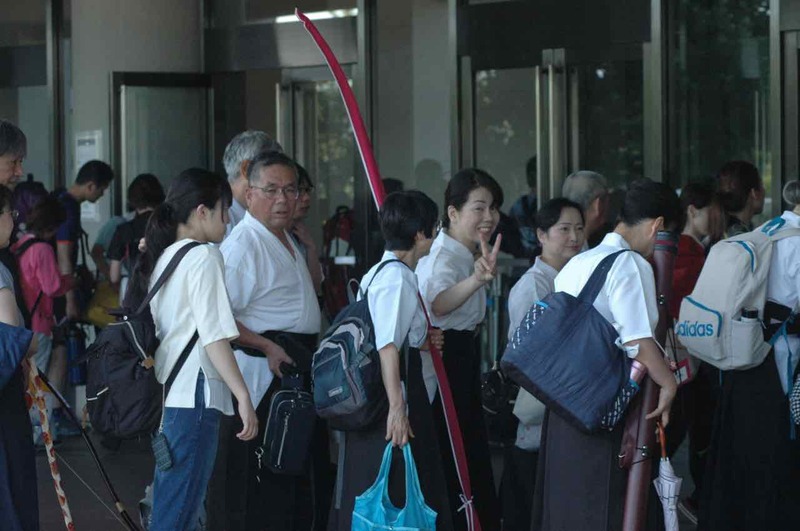 I hear a lot of comparisons between Kyudo and Shakuhachi in my Shakuhachi sensei’s talks. He is not doing the comparisons, it is happening on my head from listening to him talk. The other day for example he was talking about technique and spirit. One can have good spirit and be a technically poor player, and the other way around. To be a “player”, master, you need both, you must have both. Once you have technique, then your spirit must excel forward, beyond the technique. Something like that. 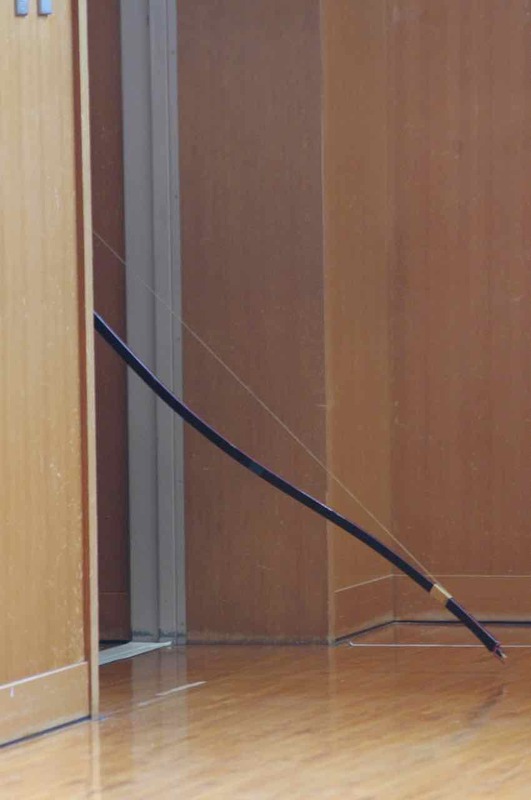 Anyway I am hearing the Kyhon ( kyudo bible) in my head. 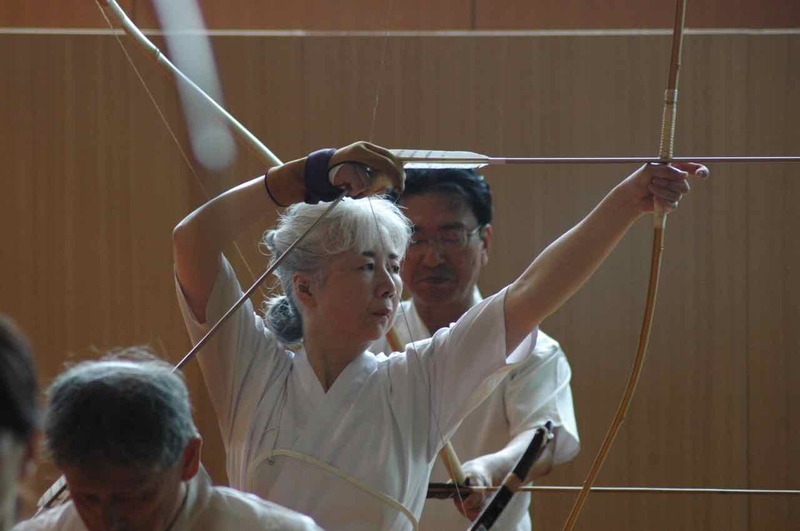 I have decided it is Kyudo that is more difficult! One can throw off an off note, as style, expression. However the flight of the arrow only tells the truth. The smallest detail un-balanced, off tone, makes a big difference the flight of the arrow. Hits… truth or not. Recently I go to the time spot when the main Sensei teaches. I had been given some changes, pointers over the last couple of days/week, even by him. So I felt reasonable good going to practice. I also needed him to check over my paperwork for the Shinsa. As expected I got corrections, a good thing always. Even more so by someone in the upper levels. Parts of the adjustments were on the same issue, the tenouchi. One of my demons. Ok, I made mental notes and practiced. I could not put in long hours that day, as I was expected elsewhere. I decided pretty much by the end of the day, the up coming shinsa was not a good idea for me now. Still more training was needed. 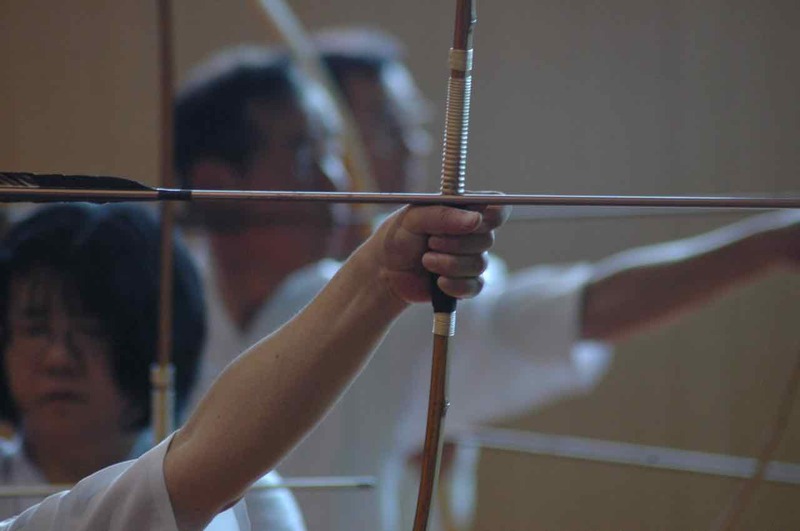 I figured I would see how I did in the up coming Tai Kai, to make the final decision, dependant on how the arrow flew. I found out later that the section on the form, Watase Sensei was referring to was about workshops , seminars. 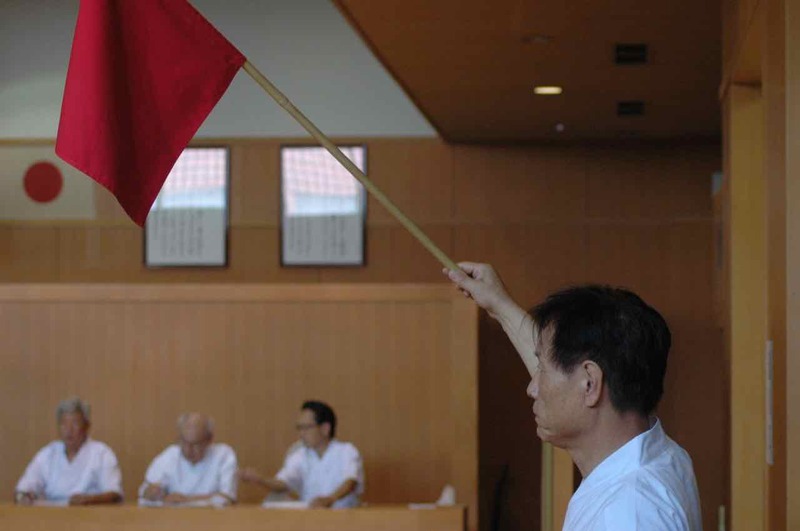 Sensei had said I had not attended any since the states. I should have some time with them on the form. I did not even think I was suppose/needed to attend those if I was getting plenty of help in the Dojo, it was a personal choice option only. I am still not sure if I NEED/MUST attend. I will anyway at least one. I figured it would be too difficult following group instructions in Japanese. Well I will found out. In Oct that is when the next section is held. 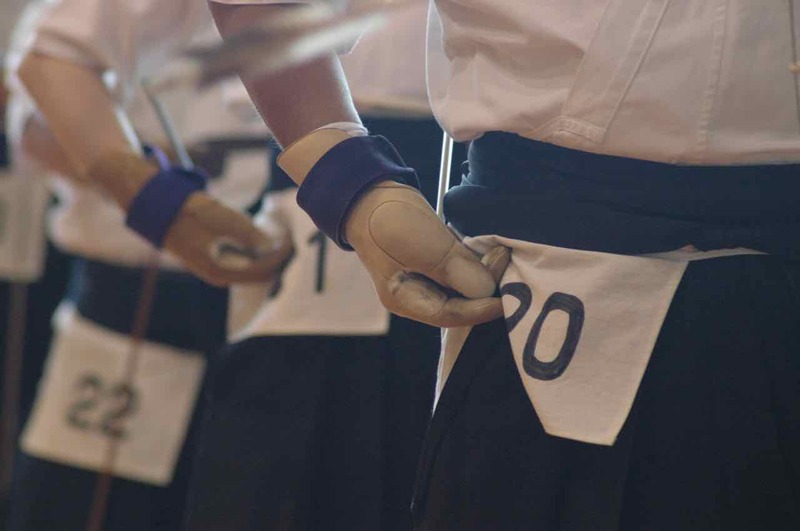 Ok on to the TaiKai. It was a hot hot day. There was a typhoon on the way arriving the next day. It was humid! There were four other dojos in attendance. Sensei was watching me like a hawk when I shot. I could feel his eyes! After the second round he comes over and tells me how way off I am on things. I had only one hit by then after 8 shots. After lunch I have one more round, I get two out of four. It was settled for me after the first round I was not ready yet for Shinsa. After everything was cleaned up there was still some practice time available. I took advantage of it. Yamasta sensei was still there helping. He gave me some instruction as did my other Sensei. Then just he helped me after Watase Sensei left. Some of it was things I had heard before but part of it was new. I was told I was overdrawing A LOT!!! Ehhhhhh! This was a shock as I always hear I was not drawing big enough, so I thought. He explained more, where I should stop drawing, with my elbow not my hand, and just expand and drop shoulders and body into the Yumi. Once I understood what was being said, it made a difference in being able to relax in Kai. The Kaicho had always said I was too tight. I thought how can I draw full maximum and still stay relaxed!? Now I get it there is a point you draw to, which is not the full maxed out size of the Yumi. Part of the problem with my training is not being fully in control of my language skills. If I was fluent enough to understand the full details of these lessons I have been told, instead of just a small section, my progress would be a lot faster…I think so anyway. My slow progress is not so much a lack of technical skill coordination, but a lack of understanding how to use that skill, how it functions. Yamashita Sensei said, I think you will be ready for YonDan Shinsa soon. I said hmmm, next year I think. He said nothing else really, more of a sound, Ummm ne, kind of thing. Anyway, onward, keiko keiko keiko…Winter is coming.